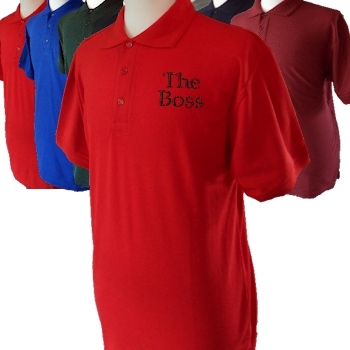 Personalised mens polo shirt with bespoke custom embroidered text of your choice. AmysGifts can provide a embroidered text polo shirt for the price shown with any text of your choice such as a name, initials, company name or a brief moto. To add a logo please email for a quote. Fine quality rugged polo shirt great for workwear and casualwear. Polyester cotton mix that is soft and comfortable to wear. Rib knitted collar and cuffs with matching buttons on a three button placket. Generous fitting sizes range from Small - XLarge, please select the size and colour shirt you require. We can accomodate special requests such as company logos and larger shirt sizes, please email us using the contact us link to the bottom of the left column of our website. Size: Small 37-38 inch chest. Med 41-43 inch chest. Large 44-46 inch chest. XLrg 47-48 inch chest.